I was very pleased today, 25 November 2009, to see that my book “So Obscure a Person” in paperback was ranked #50 amongst Virginia genealogy books at Amazon.com. The image, Stinson Book at Amazon, was originally uploaded by Edna Barney. It is posted here from Barneykin’s account. I have been listening to an audio book of “Ragtime,” which I purchased because I have tickets to the play “Ragtime” that is scheduled for the Kennedy Center in May. Halfway through the book, I have decided that Evelyn Nesbit and Harry Thaw are featured characters that I should know more about. To learn more about them is quite easy, as, before reading “Ragtime” I had never heard anything of either of them; for all I knew, they were figments of the author’s imagination. 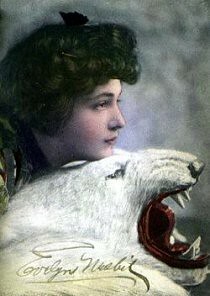 After the author’s coverage of Houdini, Teddy Roosevelt, Admiral Byrd, the famous psychiatrists Freud and Jung, I decided that murderer Harry Thaw, Gibson Girl Evelyn Nesbit and Evelyn’s lover Stanford White must have been historical characters. In 1906, Harry Thaw’s trial for the murder of White was labelled the “Trial of the Century.” Of course, OJ Simpson had not yet been born, and his trial for murder was fated for the end of the same century. I find “Ragtime” interesting reading as it covers the historical events of my father’s boyhood. He was born 1901, and came to the U.S. as a teen. Also, my grandmother and my mother had grown up on a Virginia plantation of the family of another Gibson Girl, Irene Langhorne Gibson. I remember my grandmother recounting how she and her siblings played with the discarded drawings of Irene’s artist husband, Charles Dana Gibson. This is all doubly intriguing, as E.L. Doctorow links all of his historical characters with one another, and with his created characters, and I have found that my own family is linked to the very same people of his novel. UPDATE WARNING: I downloaded this audio book from the Apple Store through iTunes. Halfway through the book I discovered that four or five chapters in the middle are missing. This is a defect in the actual audio book that Apple sold me, not a download problem. This is the very first book I have downloaded from Apple, so needless to say, I am NOT impressed. The image, Evelyn Nesbit, was originally uploaded by westiemom. It is posted here from Barneykin’s Flickr account. Visit Neddy’s Archives for more of Edna’s writings. 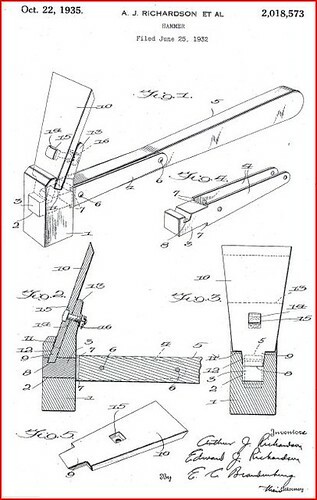 My father and grandfather patented this masonry hammer in 1935, while they were living in Baltimore, Maryland. I just came upon Google’s Patent Search and looked up their names, Arthur J. Richardson and Edward J. Richardson. Voila – their patent popped up immediately: HAMMER – Richardson et al. An interesting bit of trivia is that I see my father was using only the initial “J” for his middle names. His full name on his birth record was “Edward Arthur James Richardson.” I am posting it under “technology,” although that does seem a bit odd for a hammer in today’s computer world. But … it was something new, wasn’t it? A new technology for masonry? Those ever-inventive Richardsons! What will they think up next? See A Richardson Grandson. The image, Richardson Hammer, was originally uploaded by barneykin. It is posted here from Barneykin’s FLICKR account. Visit Neddy’s Vanishing Memories for more of Edna’s writings. 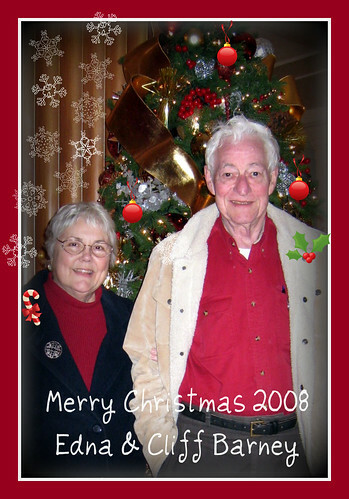 I made this Christmas card using Picnik. My 2008 Christmas Card, was originally uploaded by barneykin. It is posted here from Barneykin’s FLICKR account. Why not take an interest in your children, when they are yet children? Why not, indeed? Even a Communist can be right at least sometimes. I am trying to learn more about other political systems, now that the old ones that I have been used to are being plowed asunder. With the banks recently nationalized in America, and the automobile industry soon to be, I am trying to understand the coming political movements and the ramifications. That is why I have been reading socialist and communist writings to see what is in store for us. Then I happened upon this little gem from an Italian communist, which was much more interesting than anything I had read about communism before. This may no longer be our fathers’ America, but, even if we go communist, we will probably still have “parents” in America. The poem “Ingratitude,” by William Shakespeare (1564-1616), is a lesson from the ages. It should be a part of the education of every child to learn to be grateful. Unfortunately, in America, few parents read Shakespeare and it seems that few parents understand the importance of teaching graciousness to their children. In fact, it is obvious that many American parents actually teach their children “ingratitude” as a “refined” vice. Perhaps for this reason Shakespeare’s poem “Ingratitude” was included in Mary E. Burt’s 1904 anthology entitled “Poems Every Child Should Know,” (#16). Does your child know any of the included poems, such as this one from Shakespeare?